No, not those boobies — I’m talking about birds here! (Although I’m curious to see how many hits I get to my blog for the wrong reasons, lol.) It’s finally time for some stories from our vacation on Kaua’i. This one is about two of the most dramatic things that happened on our trip, both involving birds. Our first stop as we explored the island was Kilauea Point National Wildlife Refuge. Many visitors are drawn to this spot because it’s the northernmost point in the state of Hawai’i. Others come to see the picturesque lighthouse. You won’t be surprised to learn that we went there to see the sea birds (ha ha). It hadn’t crossed my mind to check the hours before heading over there, so we ended up having to wait outside the gate for 45 minutes. But that was fine, because the view from outside the gate was the best view of the lighthouse anyway, and I used the time to get up close and personal with some exciting birds while we waited. Almost every bird I saw on this trip was new and exciting; it was like being a kid in a candy store, running around wide-eyed trying to see everything at once. I still smile when I think of the Red-crested Cardinals that are so common all over the island. They’re such close relatives to the familiar and beloved Northern Cardinals we have here in Michigan, and yet they’re so different. I mean, just look at these birds, will ya? These cardinals were brought to Kaua’i from Brazil, so I thought of them as being all dressed up for Carnaval, the big festival in Rio de Janeiro. But while the people of Rio only wear their flamboyant costumes for a few days each year, these birds keep their magnificent outfits all year long. I was lucky enough to find an approachable pair foraging on the ground and got my best shots of these adorable cardinals right there. I’m all dressed up, where’s the party? The Hawaiian Geese called Nene (“nay-nay”) are also very approachable. They kept coming too close for my camera lens, forcing me to keep backing up to get shots of them. I love the patterning on their necks, and they made a soft murmuring sound that was very endearing. I think they were begging for food, actually. The Nene is Hawaii’s state bird, and is on the Endangered Species List. In 1951 their population had declined to about 30 birds, but thanks to intensive conservation efforts, there are now about 2,000 of them living on several of the Hawaiian islands. Notice the roosters behind me as I was taking photos of the Nene? Well these roosters were the source of the first dramatic moment of the morning. Just like the geese, the roosters have no fear of humans. In fact, they’ll follow you around begging too. They’re all so beautiful, each with their own colors and patterns, that I couldn’t resist reaching my hand out to draw one closer to me. As I knelt down and started to extend my arm, I knew it wasn’t the smartest thing to do. But by then it was too late. The rooster, assuming I had food in my hand, lunged for it with a fast pecking motion of his head. That, of course, startled me and I fell onto the pavement, tearing a big gash in the side of my ankle. And even worse, my camera with the expensive 300mm lens on it also hit the pavement. I felt like an idiot. Thankfully nobody was watching, or at least they had the decency to pretend they hadn’t seen what happened. Eric and I now refer to this incident as “the day Kim was attacked by a rooster.” I’m not proud of it, but it is funny. I still have a scar on my ankle, but my camera was unharmed. Ok, maybe that was a mini-drama. I might have exaggerated for effect. White-tailed Tropicbird – isn’t he beautiful? Shortly after the rooster attack, the gates opened and we drove down the narrow, winding road to the parking lot beside the lighthouse. We’d been able to watch the large seabirds from outside the gate, but down on the point we got to see them soaring directly over our heads. And they were awesome. There were White-tailed Tropicbirds, Red-tailed Tropicbirds, Red-footed Boobies, Wedge-tailed Shearwaters, and Great Frigate Birds. Unfortunately we were there at the wrong time of year for the Laysan Albatrosses to be around. You can’t tell from a photo, but that bird has a seven foot wingspan and can live for thirty years. Just fantastic birds! I think the blue bills of these boobies are so pretty. And I learned that they use their big red webbed feet to incubate their eggs (most birds incubate their eggs by sitting on them so they absorb heat from a brood patch on the parent bird’s abdomen). That’s interesting! Two on one, no fair! The booby drops its food — see it in mid-air? A good day for the frigatebirds. The booby, not so much. 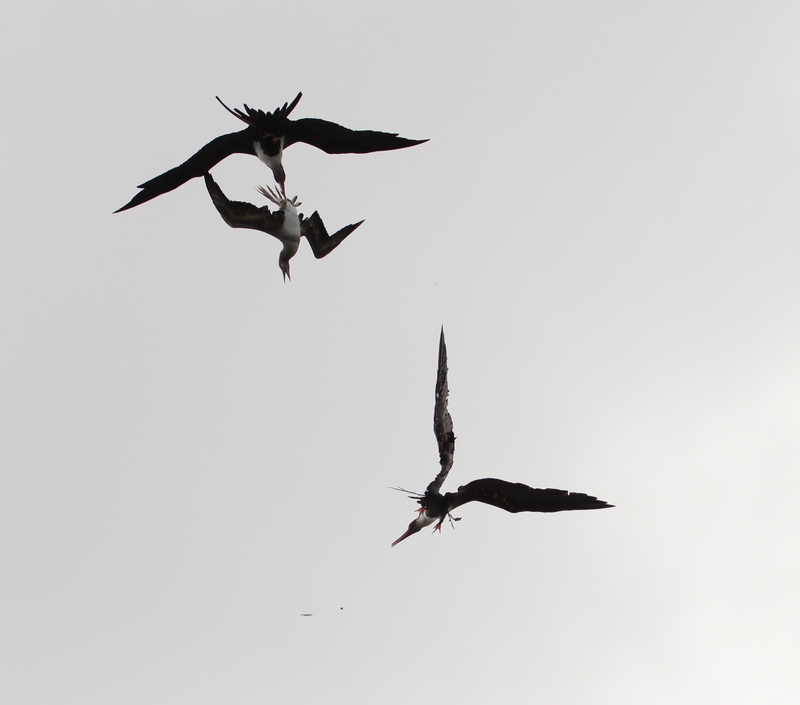 The frigatebird swoops down and gets an easy meal. Well, relatively easy. At least easier than finding your own fish, I guess. There’s lots of loud squawking whenever this happens, so it’s hard to miss it. Or so I thought. I was amazed to notice that lots of my fellow tourists didn’t even look up when the birds were screeching directly overhead. I felt sorry for those who missed a golden opportunity to witness this amazing spectacle. But one thing everyone did notice was the baby Wedge-tailed Shearwater tucked into a planter right beside the doorway to the visitor center. Thankfully the officials had made a barrier of yellow tape to protect the baby, because people were really pushing the boundaries trying to get their phone cameras right in its fuzzy little face. I was glad I had my telephoto lens on so I could take my photos from a respectful distance. Poor little guy. I can’t imagine how the parents were managing to get in there to feed him with so many people crowding him all the time. 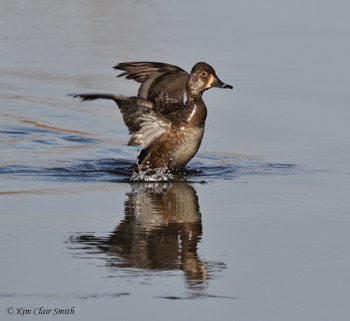 This entry was posted in Birds, Travel and tagged birding, birds of Kauai, Hawaii, Kauai. Bookmark the permalink. Hello, Kim. May I have permission to use your trip to Northeast coast of Kaua’i, in one of our future issues of the Nature Place Journal? We used one of your articles previously on kayaking. I believe our readers would enjoy this trip with you by your account. If you remember, this journal and those participating donate their time and resources to make each issue a great experience for the readers. Thanks for considering. Kim, what a spectacular series of photos! I laughed so hard picturing the rooster scene! You did a great job documenting the frigates and the booy. I actually, loved the White-tailed Tropic bird best, but the Red-Crested Cardinal was a close second. What an absolute delight to finally hear about your trip. I hope there is more to come? Glad you liked them! Yes, more to come — at some point.